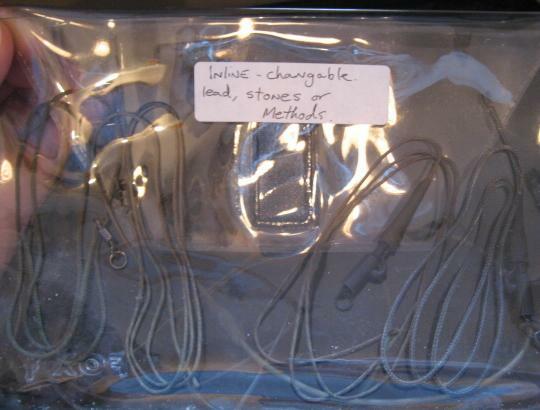 These leadcore leaders are interchangeable between inline leads, inline stone weights, method feeders and lead clips. This set up means you wont have to create new leadcore leaders for all of these fishing tactics, for example, you can quickly change from inline lead to using a method feeder by only having to tie a few knots. The benefits of using the quick change inline leadcore system is that it saves you time and effort enabling you to relax more and enjoy you carp fishing session. In the pouch above I have numerous inline leadcore leaders pre-tied. Most have a lead clip on them for easier storage, rather than packing them away with a big lead or method on them. The clips will easily slide off and changed over to another fishing method within seconds. I also make sure to have a selection of different colours available, see in the photo below. Different colours of pre-tied leadcore leaders to choose from. Select the one that best blends in with the colour of the lake bed. I have Weed green, Silt black and Black & White Fleck to choose from. The lead clip pulls off the swivel with a little force and enables me to completely remove the lead clip from the leadcore. I can now slide on an inline method feeder, inline stonze weight or inline leads. Now thread on any carp fishing tactic you wish to use. 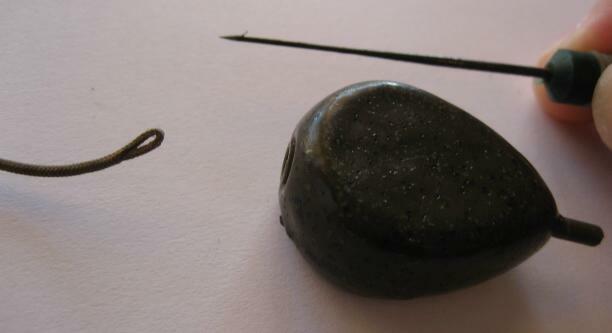 In the photo I show how to create an inline lead with leadcore material. Always make sure you use the correct swivel that was designed for the inline lead brand you use! Here I thread on a Korda inline method feeder. This only takes a few seconds to change over. Using the inline leadcore leader with inline Stonze lead systems. these can be used as free running rigs or, as shown in the above photo, as semi-fixed. 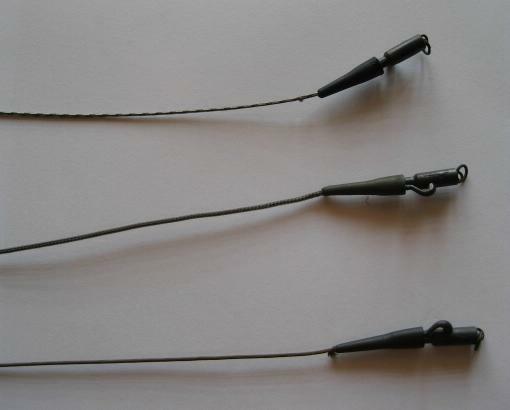 These quick change systems can be adapted to use any method of inline system for catching carp, here I change over to an inline liquid attractor lead. This can be a great carp fishing tactic when fishing for carp on single hook baits. Once I have chosen my preferred carp fishing method I quickly tie the loop of the leadcore leader to my mainline. Now my new carp rig is ready to target those big carp, fingers crossed!